Food52 founders Amanda Hesser and Merrill Stubbs launched their now-renowned website based on the notion of “genius” recipes—recipes that "change the way you think about cooking.” Recipes that are elegant, easy, original, and translate from kitchen to kitchen, coast to coast. Readers alert genius editor Kristen Miglore to their finds, and post comments on the weekly selection. 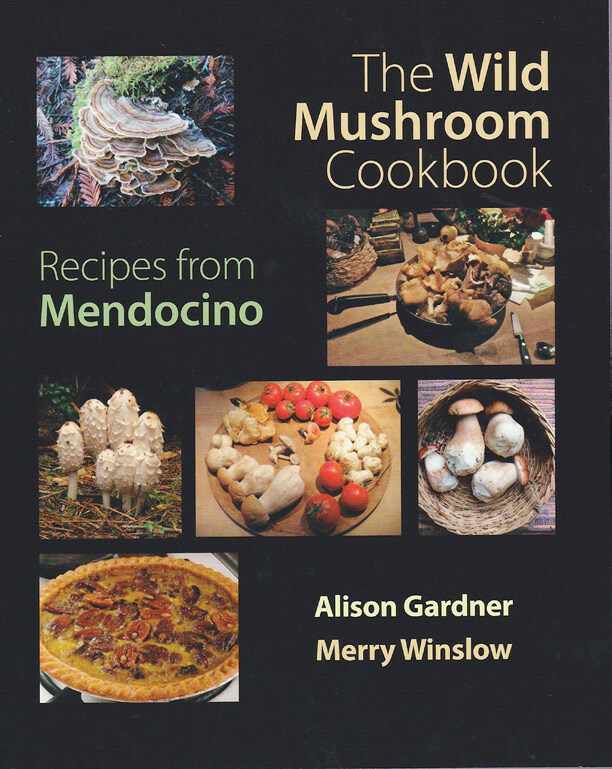 The Wild Mushroom Cookbook offers several such genius recipes from a passionate community of resourceful, woodsy Californian mushroom hunters. We, too, are resourceful and woodsy—two out of three—which was enough to discover some of the book’s genius recipes that worked spectacularly in our Iowa kitchens. This extensive collection is the result of years cooking and sharing successes. The back cover of The Wild Mushroom Cookbook claims it offers “the most comprehensive collection of wild mushroom recipes ever assembled.” Indeed, it would take years to make the 299 recipes in the book. Not only do the mushrooms featured in the book span the west coast collection season, the mushrooms and recipes that the authors have collected span years. Gardner and Winslow met in a mushroom identification class at the College of the Redwoods; their professor, Teresa Sholars, wrote the book’s foreword. Several recipes in the book were created by students in Sholars’ 1981 class for a booklet called “Gathered Mushroom Recipes.” Other recipes come from friends and acquaintances in the Mendocino region. With so many recipes to choose from, it was easy to find dishes that appealed to our tastes. And unlike any other mushroom cookbook we’ve seen, The Wild Mushroom Cookbook has extensive chapters on drinks and desserts, courses that we rarely neglect. Most of the recipes we tried withstood the book’s test of time and distance. Some of the recipes, however, such as the “Vegan Hedgehog Sandwich Spread,” felt slightly old school in their ingredients, techniques, and taste. Likewise, some recipes we tried seemed too light-handed on spices—especially pepper and fresh herbs—which required a re-seasoning at the end. This doesn’t bother us; we’re confident cooks who like to play around and compare notes. But if you prefer to follow recipes exactly, keep your eyes peeled for the ones that list familiar levels of herbs and spices. That doesn’t mean some of the less-spiced recipes didn’t dazzle. One of our favorites was the super simple “Mushroom Ratatouille” (though we doubled the marjoram and added fresh parsley and basil). It never ceases to amaze us how delicious mushrooms can be in the simplest surroundings; here: sautéed with onions, eggplant, green peppers and tomato sauce. Because it’s difficult to get fresh cauliflower mushrooms in Iowa, we used fresh Chicken of the Woods from a recent monster haul. The result: easy, hearty, and delicious. The recipe for "V9 juice" was a Eureka moment; it turned V8 juice, already a favorite savory drink, into a umami shot. It smoothed the acidic edge of V8 and was good warm or chilled. The next time we make it, we’ll introduce it to some ice cubes and a lonely bottle of pepper vodka in the back of the cupboard. This concept will also work well with local wild mushrooms: in the fall, we can find puffballs as big as goats and make a quart of puffball powder overnight. This powder is shockingly intense and will surely be as marvelous an addition to the V8 as dried porcinis from the grocery store. Because of the oily blandness of most of salad dressings, we often skip them and just eat our veggies the way rabbits do. But in “Mushroom Soy Vinaigrette,” mushroom powder transformed oil and vinegar as it did V8 juice. (We used dried matsutake). The powder also acted a great thickening agent, giving the dressing a more bold substance. It was delicious on a bowl of fresh pea shoots and flavorful enough to transform rabbit food into a civilized salad. Shrimp will be next. The instructions say to make the dressing a day in advance. Do it. An overnight rest sets it right. Another intriguing technique was smoking mushrooms, as used in “Smoky Eggplant Dip.” Smoking the mushrooms for twenty minutes away from direct heat imbued them with a rich, mellow flavor you could eat without any additions. The dip itself incorporated sour cream which gave it a smooth, cool, but slightly 80s note. We added fresh herbs, salt and pepper to the finished product, but it was well worth the fix to experience the pleasure of smoked ‘shrooms. We wondered the effect that different wood chips would have of different species of mushrooms. Now there’s a cookbook. The bright, vibrant Asian flavors of Salmon and Matsutake Oriental Salad stood out. We’d double the dressing and add something crunchy like nuts, water chestnuts (talk about old school), or (gasp) crumbled Ramen noodles. Black trumpet cream of nettle soup was good and practical — homely even, given the color that results when you blend black with the green drab of cooked nettles. As the headnote observes, black trumpets and nettles are a "winter forager's delight." Nettle is out here anytime but winter so it does coincide with black trumpets and any other mushroom you'd find. Even better, it called for only 2 cups of nettle; has anyone ever managed those recipes that call for 2 pounds? “Mushroom Bread” was a great accompaniment, but it would’ve been superb if the filling had been doubled. We opted for sundried tomatoes instead of the Kalamata olives, which gave the bread a tangy robustness. Mendocino is candy cap land: the book is full of wonderful sounding recipes using them: candy cap glazed nuts, candy cap upside down cake, candy cap ice cream soda . . . Luckily, we can find them on the internet—but at prices that inspire restraint. We chose the candy cap cornbread with bacon fat and crumbled bacon. Sweet and salty almost always spices things just right. This bread also had a fine crumb that distinguished it from most corn breads; perhaps the 1/4 cup of powdered candy caps absorbs some of the liquid in the batter. The Wild Mushroom Cookbook contains genius recipes for every cook—no matter where you live—that will help you discover wild mushrooms’ ingenious potential. It’s a joy to see what a thriving community of mycophiles can cook up! Put all ingredients in a jar and shake well to blend or mix in blender until smooth. Best if made a day in advance of using to allow flavors to meld.